Love her or hate her, most commentators have agreed that Margaret Thatcher was a towering figure – for good or ill – who helped to shape Britain and the world. It is, perhaps, not surprising that, on the occasion of her death, and in line with the modern tendency to lionise and exaggerate the importance of individuals, many features of today’s world are attributed to what is called Thatcherism. 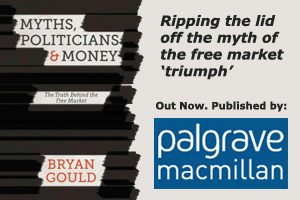 We can now see, or should, that the problem that Callaghan was trying to describe was not the supposed failure of Keynesian economics, but a refusal to understand that – if we wanted to match the economic achievements of other countries, defeated in war, who had set about with gusto the task of rebuilding their economic strength, and even more of yet other countries that were rapidly industrialising – we needed to stop assuming that we were entitled to economic success and to think of ourselves as an economy that also needed to change rapidly if we were to keep up. Our problem was, in other words, one we refused to recognise – that in the face of others becoming hugely more competitive, we were locked into comparative decline, epitomised by our focus on defending the value of sterling rather than recognising our loss of competitiveness; indeed, the whole subject of competitiveness and exchange rates was at that time taboo, as I learnt at first hand when I attempted to table parliamentary questions on the subject. That loss of competitiveness meant that we could not grow without other problems, like the constant threat of inflation and a perennial balance of trade deficit, holding centre stage. This led many to conclude that some of the central aspects of what had been bipartisan policy were at fault and – as obstacles to a better performance – would have to be abandoned. So, public ownership, government responsibility for securing full employment, a welfare state that guaranteed basic services, were tacitly targeted as necessary sacrifices. By the time Thatcher won the 1979 election, there was no shortage of pundits to tell us what needed to be done. Political philosophers like Hayek and Nozick, with their emphasis on small government, became newly popular. Milton Friedman and the Chicago school advanced the merits of monetarism – a painless and foolproof way, it was thought, of dealing with inflation that also had the advantage of getting government out of the picture and handing economic policy over to bankers. She must have been amazed, having negotiated a period as a less than impressive Leader of the Opposition, and an initial year or two as one of the most unpopular Prime Ministers in history, to find that the battleground on which she was required to fight had been virtually vacated by her opponents, who had on the whole retreated to their own ideological fastnesses while they waited – as it turned out, in vain – for the political pendulum to swing. She found that the shift in opinion that had taken place over the previous decade meant that there was now little obstacle to the implementation of the agenda offered by her lieutenants; and, emboldened by her success in recapturing the Falklands, she began to flex her muscles – and to enjoy it. In the event, contrary to some of the more fulsome tributes paid to her, she muffed the opportunity provided by the absence of effective opposition and by North Sea oil coming on stream, and – in thrall to monetarism – ensured that any benefits from the oil were immediately offset by the decline of manufacturing that monetarist theory asserted was inevitable. Far from “saving” Britain, she was responsible for a huge missed opportunity and, by treating manufacturing as expendable, compounded our competitiveness problem. It must have been, nevertheless, a thrilling experience for her to discover that – contrary to so many expectations as to the difficulties that would be faced by a woman leader – she was able to wrong foot and discomfort both colleagues and opponents by simply insisting, with increasing stridency and certainty, on getting her own way. It was in this respect that Margaret Thatcher made her contribution to Thatcherism; she did not invent it, or even necessarily foresee it, but when it became apparent, she liked what she saw and, by serving as its instrument, discovered her destiny. Those powerful forces that were unleashed by the triumph of the “free” market – a triumph in a battle that is constantly fought between the powerful and the ordinary people, but in which the powerful have for the time being prevailed – were extraordinarily lucky that the person who headed the government at the critical time and to whom it fell to bring about the change that they saw as necessary may not have been a great political thinker, still less a ground-breaking economist, but had the force of personality to drive that change through. It was a change defined and willed by others but delivered by Margaret Thatcher. With her passing, nothing much changes. Those same powerful forces are still in charge, perhaps fighting a rearguard action in the aftermath of the global financial crisis, but using their power to entrench their advantage. So let us be clear; to elevate Thatcher to the stature of a one-woman revolution is to miss the point and to divert attention from the real forces ranged against us – still very much in evidence – and the battles that still have to be fought. This article was published in the London Progressive Journal on 12 April.